You are invited the research groups to propose Epoch-Making Initiatives Projects, which is a category newly established in FY2015. Detailed information is provided in the following. Such calls to research groups are made only once a year (only in the B term). The purpose of this call is to create and develop unexplored fields in combined and interdisciplinary research beyond the boundaries of traditional fields and to broaden the basis for using SPring-8 in these fields. We encourage the production of qualitative and quantitative research results using SPring-8. To achieve these goals, we are calling for research groups that will carry out research in unexplored fields using SPring-8. When a research group is selected, the project director will be entitled to lead, at his/her discretion, the Epoch-Making Initiatives Proposals, which will be executed by project leaders, using multiple beamlines within the effective period (two years). Moreover, the beamtime can be arbitrarily allocated within the allowable range for each term (although the number of shifts for beamtime will be determined after review). 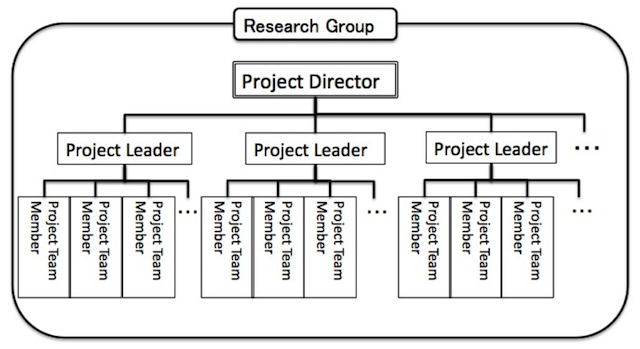 The structure of a research group targeted in this call is as follows. Note: Once the research group is selected, the project director and project leaders are determined and cannot be changed (their numbers cannot be increased or decreased). However, the project team members can be changed and their number can be increased or decreased within the research period [see Section 3(1)]. After passing the document screening, the project leaders should register their individual related research proposal online by the designated date in keeping with the research plan submitted upon application as an Epoch-Making Initiatives Proposal. For details, refer to “4. Procedure from Application to Review.” From the next A term, these proposals should be registered similarly as Epoch-Making Initiatives Proposals for each beamline through the User Information website (UI site) before the start of each term. The Review Committee will review the content of the registered Epoch-Making Initiatives Proposals and then determine the beamlines to be used and the number of shifts allocated. The beamtime will be allocated for two years from 2018B to 2020A. Please note that the beamtime available at RIKEN beamlines are less than those at public beamlines. *Minimum number of beamtime available to users is 3 shifts. ① The project director should contact the Users Office (sp8jasri@spring8.or.jp) via email. ② The Users Office will send the project director the form for SPring-8 Epoch-Making Initiatives Research Plan (electronic file) via email as an attachment. Email messages will be sent only on weekdays (9:00 to 17:00 JST). Therefore, be sure to contact the Users Office well in advance. ③ Read the Instructions on How to Fill out the Form for Epoch-Making Initiatives Research Plan and enter the required items in the form. If you have any questions, contact the Users Office (see “10. Contact”). ④ After filling out the form, the project director should submit it to the Users Office (sp8jasri@spring8.or.jp) via email by the submission deadline indicated below. ⑤ The Users Office will check the form (for input omissions and other problems) and send an email notification to the project director acknowledging the receipt of the form. If the project director does not receive any reply from the Users Office within 2–3 working days, contact the Users Office (see “10. Contact”) as some problem, such as transmission or reception error, may have arisen. You are strongly encouraged to complete and submit your application well in advance of the deadline. ⑥ After the deadline for submission, the Review Committee will screen the applicant research groups on the basis of their submitted Epoch-Making Initiatives Research Plan. ⑦ The Users Office will inform the applicant (project director) of the result of the document screening via email. The project director whose proposal passes the document screening will be informed of the timing of the interview and should complete the online registration of individual Epoch-Making Initiatives Proposals. In the interview, the project director must make a presentation of the research plan, so the materials for the presentation must be prepared in advance of the interview. ⑧ Each project leader should complete the registration of his/her Epoch-Making Initiatives Proposal through the UI site by the deadline indicated in the following. Applicants are advised to be prepared in advance because there are only few days from the notification of the result of the document screening to the deadline for the online registration. The registration should be carried out through the UI site. For details on the items required for input, refer to the Proposal Application Templates. For the procedure for entering data on the subsequent pages, refer to the Proposal Application Templates. ⑨ The interview consists of the presentation and question-and-answer sessions. The project director should make an oral presentation.The materials used in the presentation should be submitted to the Users Office (sp8jasri@spring8.or.jp) as a PPT or PDF file before the interview date. *The project director will be informed of the details of the time and location via email (step ⑦). As a rule, the project director should attend the interview. The project leaders may be allowed to attend the interview, if considered necessary. Keep in mind that the interview date cannot be changed. The review criteria are as follows. The proposed research should be cutting edge and its science and technology field should have the potential to contribute to the development of a new research field. The following four requirements must be satisfied. The project directors will be notified of final review results in writing early August, 2018. The project leaders are required to submit an Experiment Summary Report online within 60 days of their Epoch-Making Initiatives Proposal in each term. Submitted reports are made publicly available online two weeks after the report submission deadline for the last experiment of the term (60 days after the end of each half-year research term + two weeks). For details, click here. Publish your results in the form of a refereed journal (incl. refereed proceedings and dissertation), a SPring-8/SACLA Research Report refereed by JASRI, or a technical journal approved by JASRI, and register the published works with the Publications Database within three years from the end of the research term. In the publications, please clearly state that the results were obtained through the use of the SPring-8 specifying the relevant experiment title and number. *All Epoch-Making Initiatives Proposals carried out by a selected research group within the effective period (two years) will be treated as a series of proposals despite the fact that multiple proposals exist. In such cases, the three-year deadline is counted from the end of the first research term. Make a poster presentation at the SPring-8 Symposium, which is held once a year. Register your results when they are published. Up to two research groups will be selected at one call period so that flexible activities of each research group can be appropriately ensured within the limited available beamtime. For the same reason as (1), up to four research groups may perform experiments concurrently, regardless of the period in which the proposal was expected. The call of Epoch-Making Initiatives Proposals will be carried out once a year (only in the B term). The next deadline for proposals is scheduled for early May 2019. However, the call will be tentatively cancelled if four selected research groups already have been accepted to conduct experiments in the next B term. After the effective period (two years), the achievements of the research group will be assessed (by document submissions and interviews).